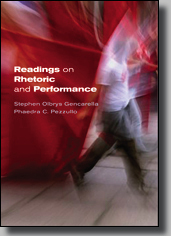 This volume explores the new conceptual issues and cultural insights emerging at the intersection of rhetoric and performance studies. Twenty essays from the scholarly literature cast new light on communication practices and forms that educate and inspire people, create ideas and public controversy, and arouse political action. Introductions to the volume and each of the five sections guide student reading by identifying key themes and placing them in their social and scholarly contexts. Reviewed in Journal of Folklore Research (2013). Stephen Olbrys Gencarella is an Associate Professor in the Department of Communication at the University of Massachusetts, Amherst. He has published articles in several journals, including Communication and Critical/Cultural Studies, Communication Education, Critical Studies in Media Communication, Folklore, Journal of American Culture, Journal of American Folklore, and Rhetoric Society Quarterly. An award-winning teacher, he offers courses on rhetorical theory and criticism, folklore studies, and social theory. He currently serves as the Director of the university's Junior Year Writing Program and is an elected member of the Board of Directors for the Massachusetts Teachers Association, one of the largest democratic organizations in the commonwealth. More information on his research, teaching, and service is available at www.umass.edu/communication/faculty_staff/gencarella.shtml.